Mobile Car Body Shop in Wembley NW10 to take car bumper scuffs, malicious paintwork key scratches, alloy wheel scuffs, car bodywork dents / dings and stone chip’s away in Wembley NW10. We are on hand to provide client’s in Wembley NW10 with professional mobile car bumper repair, car scratch repair, bodywork dent repair and alloy wheel repair services. 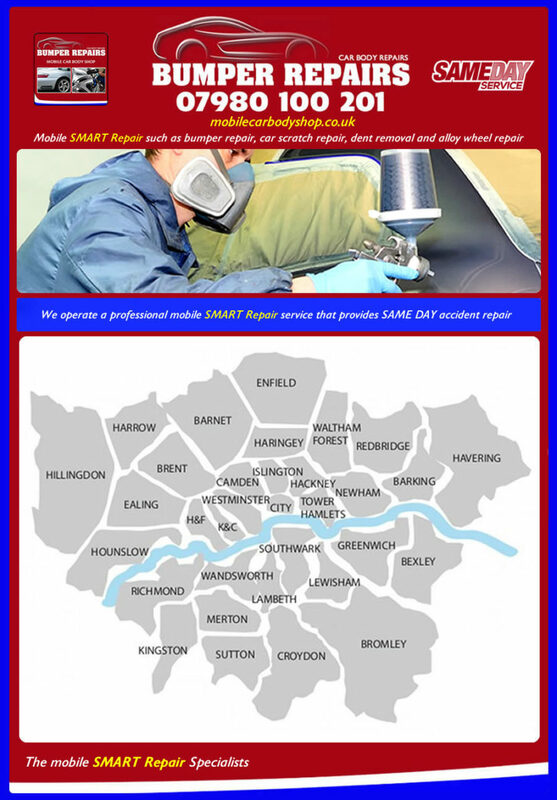 Our fully mobile car body shop service enables us to provide a wide variety of mobile SMART Repairs at your home or work location in Wembley NW10, saving you the inconvenience of taking your vehicle to a bodyshop and being without your vehicle for an extended period to time. Mobile bumper repair in Wembley NW10. Mobile car bodywork dent repair / removal in Wembley NW10. Mobile car paint scratch repair in Wembley NW10. Mobile textured plastic trim repair in Wembley NW10. Mobile wing mirror casing repair in Wembley NW10. Mobile alloy wheel repair in Wembley NW10. Our professional vehicle technicians have many years experience in fixing a wide range of vehicle damage in Wembley NW10 and can deal with scrapes and scratches that often occur by accident with a perfect colour match to your existing paintwork. The majority of bumpers on modern cars which crack and split can be repaired at at your location in Wembley NW10, fast, conveniently and cost effectively using the latest plastic welding techniques to ensure your bumper retains its strength removing the need to purchase an expensive replacement bumper from your dealer. Alloy wheel repair in Wembley NW10. Mobile car body repairs in Wembley NW10. We cover Wembley NW10 and practically the whole of London and our mobile car body shop units are kitted out with the latest equipment to enable us to provide you with the very best in mobile car body repairs quickly and efficiently. All our vehicle technicians have a real passion to provide the best quality service and we want you to be happy with the standard of workmanship we employ and will retain / recommend us to friends and family that may be located in Wembley NW10 or Greater London. Satisfied client’s are core to our business and we strive to ensure our mobile car body shop remains the trusted and premier choice in Wembley NW10. Its never been easier to get your car bodywork or alloy wheels repaired to a high standard and at a competitive price in Wembley NW10. so give us a call on 07980 100 201 or alternatively send us an online enquiry, along with some clear images of the vehicle damage ( taken in daylight ) and a brief description of what happened and we shall provide you, with a fast, FREE, no obligation quotation to repair your bodywork or alloy wheels, onsite in Wembley NW10 within one business day. Below are some examples of some of the different types of mobile car body repairs we can provide car owners located in Wembley NW10. 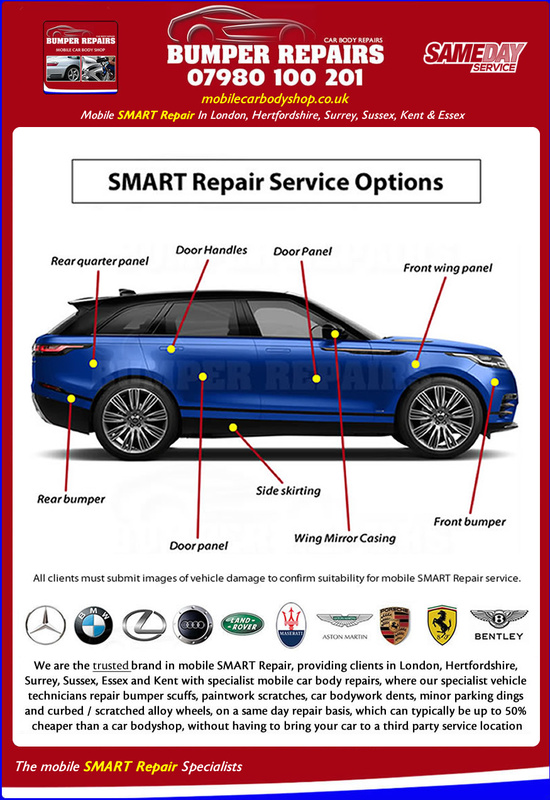 We understand your vehicle is an investment and our Mobile Car Body Shop can provide private and commercial client’s located in Wembley NW10, London and Greater London with high quality and professional bumper repair, dent repair / removal, scratch repair and alloy wheel refurbishment services. Our specialist and experienced vehicle technicians are on hand to take plastic bumper, bodywork, paintwork, plastic trim and alloy wheel, scuffs, dents / dings, vandal key scratches, splits / cracks and stone chip’s away in Wembley NW10 within a matter of hours, SAME DAY and onsite at your nominated home / work location. Mobile Car Body Shop/Repairs Wembley NW10, London	Overall rating:	4.8	out of 5 based on 33	reviews.